Before my husband and I got married, I had to clue him in on one of my guilty pleasures. I liked to lay in bed watching tv while eating brie and raspberry jelly on club crackers. It is divine, and you should try it. So, naturally baked brie is a favorite. However, slicing into the perfectly presented in puff pastry or fillo dough always seems to ruin the attractiveness from the start. Crumbles of pastry always seems to get all over your hands and mouth. Not to mention the guilt you feel for being the one who made the baked brie look like a hot mess. So for being such a sophisticated appetizer, it is a messy one! So last week I experimented with fillo dough. My goal was to make individual, bite-sized bake brie’s in a mini-muffin pan. Google “FAIL” and this idea will be on the top page of results! While I was perusing the grocery store aisles a light bulb went off…in my head not the store 🙂 Crescent Rolls! They may not look as sophisticated as the usual baked brie, but holy moly mother of meatballs are they easier to consume! And what a world of difference there is in the preparation…I’m pretty sure a kindergartner could make these. They are perfect for breakfast, dessert, or a shower of some sort. These little bites of heaven are easy to pick up and eat with out destroying the rest of the presentation. You may have to lick your finger tips, but who cares. 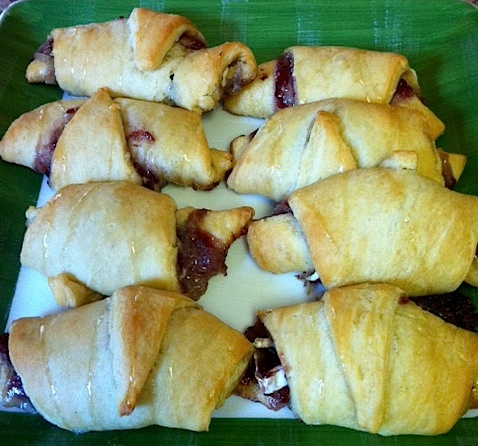 Pop open a tube of crescent roll dough and unroll them onto a baking pan, spacing evenly. 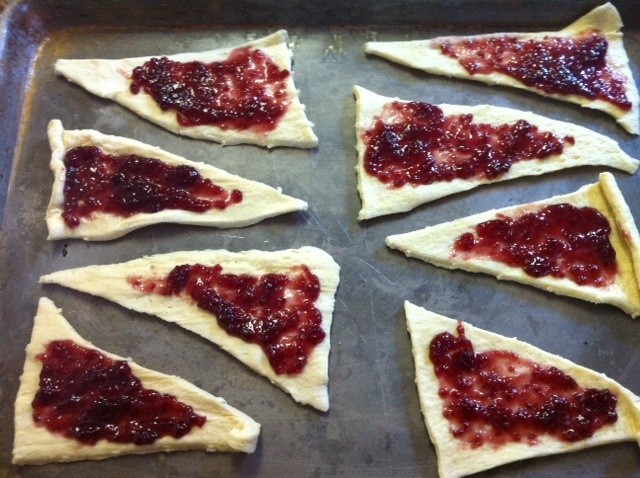 Dollop 1/2 a tablespoon of raspberry jelly onto each triangle of dough. 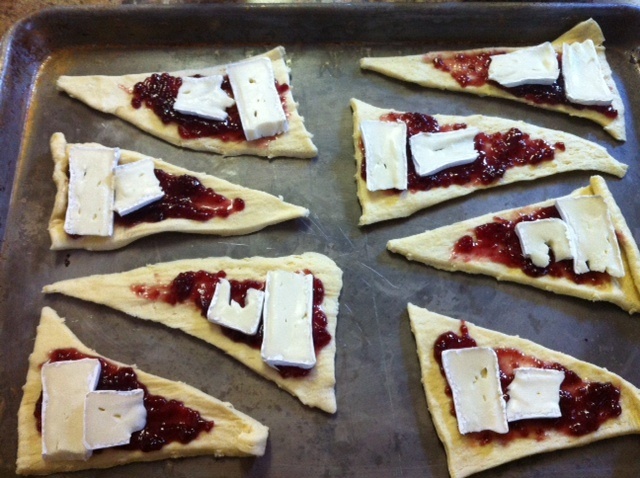 Use a knife to spread out the jelly evenly (leave a border of dough around the spread of jelly to prevent spillage). Slice the brie into pieces and place on the widest side of the dough. 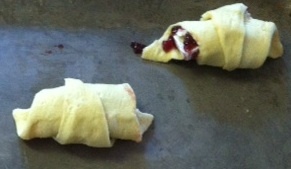 Roll the dough like you would if you were making regular crescent rolls. Bake in the oven for 11-13 minutes, until golden brown. When you remove from oven, drizzle 1/2 teaspoon of honey over the top. oh my gosh this sounds so delicious! I'm going to have to try these! I will have to admit I've never had brie. But I'm willing to give it a try. Would these taste as good with blackberry? I'm sure they would go well with any fruit jelly you prefer. I'm actually going to add more cheese and jelly the next time I make them! Let me know how they turn out with blackberry! I have to make these. I love Brie! This looks like such a great recipe. I'm going to have to make it.